A “Bison conservation area” will be established in the Gardiner Basin, and for the first time it looks like migrating bison that cross the Yellowstone Park boundary on the north end will be allowed to roam rather than be shot or trucked off to slaughter. 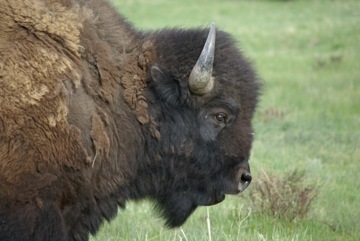 Although the area is a large 75,000 acres almost all of it is steep mountainslope that bison rarely use. The basin itself is a couple thousand acres along both sides of the Yellowstone River until the mountains squeeze it shut at Yankee Jim Canyon on the north. A hunt will be established and the annual bison slaughter ended. Apparently an average of 400 bison will need to be killed each year to keep the current population in the Park about stable. In mild years, few bison migrate north, so obviously in some years no hunt is possible. Tea partiers and cattle cranks in the Montana legislature have passed a number of anti-bison bills, so this announcement assumes that Governor Schweitzer will veto them. I think this is something to celebrate at a time when radicals have taken over many state legislatures and weird, dangerous and mean spirited laws emerge daily. Agreement to let Yellowstone bison roam in [Gardiner area]. Associated Press.